I’m not the biggest fan of sevens, but it can be a great venue to grow the game in smaller areas / schools and can serve to create a microcosm of the (much superior 😉 ) XVs game for skill and vision development purposes. 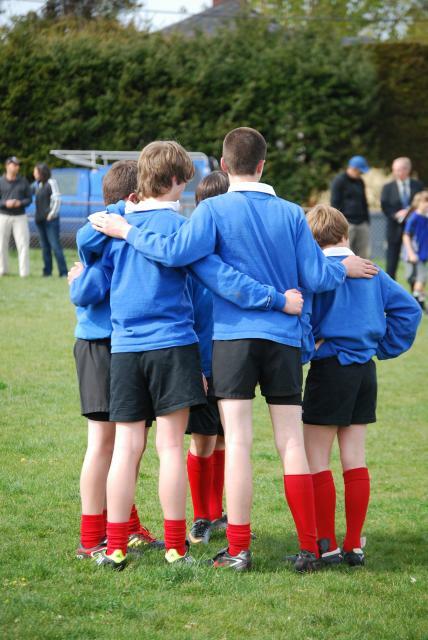 As some schools in these parts have opted for sevens tournaments this season, and to any of you who are heading into your sevens seasons, here’s how I addressed tactics with the successful school boys team I coached last year. 1. Two passes away from the ‘muck’. I conceptualised this by getting them to think about simple maths. One guy makes a tackle, one guy probably goes to ruck and two more will probably get into ‘post’ positions around it – 4 guys in about 15 or so metres of width. That leaves three guys left to cover the other 40+! There’s going to be “easy space” elsewhere. The “easy space” is space in front of the ball-carrier, giving the him more time to think and act; space in between defenders, the bigger gaps the better; and the space behind, angling runs behind defenders ‘fixed’ by team mates. 2. Go with the flow when we have quick ball and momentum. If we are beating them to the break down, they won’t have time to get set – if they’re even there at all! Eventually, we’ll draw them into a narrow area and we’ll go back to Plan A. 3. Stay on your feet. We talked about how being tackled was a ‘fail’ (kids love that word!) to the principles of going forward, maintaining possesion (not guaranteed in contact), and maintaining pressure (giving the defence chance to contest and re-organise). So we worked on timing of runs and both timing and quality of passes, support lines and communication to get the ball to the “easy space” and of what the support options are, all in an effort to avoid getting tackled. 4. … not really a ‘tactic’ but possession is everything in sevens. Keeping it when attacking. Winning it when defending. And getting it back after a try has been scored. In this photo, the French player has space in front, a supporting player on both sides and two Canadian defenders turned sideways – he should have plenty of options! Positionally, my other recommendation is NOT to have your most creative player in the traditional ‘first receiver’ role – if you agree with the ‘two passes’ tactic. We’d have one of the ‘speed’ players as the ‘first receiver’ who’s immediately play the ball to the decision maker, who had another speed player outside him. We also conceptualised this as the ‘diamond’ of our attack strategy, with the decision maker trying to always get the ball in a central position, with support to his left and right, and the player who started the play following in behind (i.e. the acting half / original passer from the break down or set-piece).